It's time for us to call it a day on Sportsday. We'll be back bright and early on Monday morning from 08:00 BST. What else could you possibly do with your weekend other than watch/listen/read the BBC's sports coverage? Highlights include the return of the Premier League, the World Figure Skating Championships and the conclusion of the ICC World Twenty20. If you want to know what's on and where, click here. Northants have signed Sri Lanka all-rounder Seekkuge Prasanna for this summer's T20 Blast. The 30-year-old, who bowls leg-spin, could play other forms of the game as well. "He's an exciting cricketer with plenty of experience and good stats, and having him for the whole T20 Blast campaign is obviously a big plus for us," said head coach David Ripley. England batsman Joe Root says his side have developed confidence along the way as they prepare to face the team to lost to in their opening match, the West Indies. Barnsley and Oxford are on their way to the national stadium this weekend for the Johnstone's Paint Trophy final. What is U's boss Michael Appleton most excited about? "Part of the experience of a showcase final is the bus ride into Wembley," he said. "It's something the players wanted and it was just something they wanted to make it feel as normal as it could possibly be." Who's up for a game of I-spy? Essex's new head coach Chris Silverwood can bring success back to the club after years of "flat-lining", according to ex-opening batsman Graham Gooch. The county has not won any silverware since 2008 when they won the One-Day Cup and Division Two of the Pro40. "He's a very balanced guy, he's passionate about leading Essex into a new era," former England opener Gooch told BBC Look East. "I'm confident he can start something special for Essex." On this day in 2003, Francis Jeffers scored his 13th goal in as many England Under-21s appearances - equalling a record set by Alan Shearer. Needless to say, Jeffers was not the next Shearer. Jeffers scoring against Turkey for England Under-21s. April 1, 2003.Image caption: Jeffers scoring against Turkey for England Under-21s. April 1, 2003. Louis van Gaal has also responded, albeit fleetingly, to Sir Alex Ferguson's suggestion that the Manchester United fans need to show patience. "He is right. I cannot deny that," said the Dutchman. "When you have to succeed a man like Ferguson, the expectations are very high. But his first four years. That is a good example. "You cannot change a team in one year. It is a process, Many times I was laughed at for saying it but it is like that. We are capable of being in top three, We believe in that. We can win the FA Cup. We have a lot to fight for." In better news on the injury front, Louis van Gaal confirmed that Luke Shaw will return to training next week. The left-back has recovered from the broken leg in the Champions League defeat in Eindhoven in September but remains unlikely to play again this season. "Luke shall start the first training sessioins on the pitch next week," the manager said. "Now he can train with his bodyweight on the pitch. But it is very difficult to play in the final of the FA Cup." Manchester United manager Louis van Gaal says Bastian Schweinsteiger will find it tough to be fit for Euro 2016 after being injured in training ahead of Germany's friendly defeat to England. "Bastian has a tragic injury," he said of the midfielder's knee problem. "The expectations are not so good in relation to Euros. He has to work hard for it. He wants to play and I hope he can reach that. It shall be difficult." You can always rely on F1 mogul Bernie Ecclestone to come up with an entertaining quote. The 85-year-old has likened the sport to a rock concert at which the band turned up but could not perform. "We are not putting on a very good show," he said, in the build-up to Sunday's Bahrain Grand Prix. "Imagine if people turned up to watch the Rolling Stones and Mick Jagger couldn't sing and the others couldn't play their instruments." Err..quite. Here's the rest of his interview with BBC Sport. Earlier on we asked you the name the four players - other than Jamie Vardy and Riyad Mahrez - to have scored more than once for Leicester this season. The answers? Danny Drinkwater, Robert Huth, Shinji Okazaki and Leonardo Ulloa. 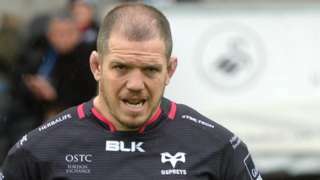 Wales and Ospreys prop Paul James faces a spell on the sidelines as the 33-year-old undergoes eye surgery. Man City to finish fourth? The more observant among you will have noticed that our vote is now closed, with 28% of you suggesting that Manchester City will claim fourth place in the Premier League. A further 25% opt for West Ham and 21% for Manchester United. Interestingly 2% of those who voted believe a team from outside the current top nine will finish fourth. Chelsea, perhaps? Yay, fourth place. Yay!Image caption: Yay, fourth place. Yay! Wonder if Louis van Gaal has heard the Argentina forward's comments? We'll hear from the Man Utd manager's news conference shortly, ahead of Sunday's game against Everton. The most laid-back heavyweight in history? Anthony Joshua has a strong claim for that particular moniker. Unfortunately for his opponents he's not half as relaxed in the ring. BBC Three has had exclusive access to the British champion in the run-up to a big fight and it's well worth a watch to see how he's handling the pressure of being the golden boy of the big man's division. Joshua fights American southpaw Charles Martin for the IBF heavyweight title on Saturday, 9 April.